With an eye to providing clinicians with a solution to grow their dental business without compromising the clinical outcome of their case, mySimplant Planning Service eases you into the world of implant treatment, as well as facilitating their more complex cases. Think of it as a coach supporting you behind-the-scenes and empowering you with the tools needed to easily plan and safely execute a surgery. All the while giving you the possibility to rely on an experienced partner to build your dental business while staying in control of your implant planning cases. Flexibility is literally at your fingertips. Our intuitive online system lets you get acquainted with computer guided implant treatment in your own time and on your own terms, with virtually no learning curve. Simply fill in the online web order form and you will receive a Simplant planning proposal from our Simplant technician for review within two days. Taking into account that the guide is manufactured within 48 hours after your approval, this entire process can take less than five days. Simple to use is one secret to a growing dental business. Growing your dental business is also a lot about doing smart savings. Outsourcing 3D implant planning reduces case time significantly and it prevents expensive investments in software licenses. Simplant Editor does away with online meetings so you have the freedom to review, adjust if necessary, and approve the plan on your Mac or Windows computer, anytime, anywhere. You’ll also have more time to focus and treat patients, and even take on more work. Precise planning is the best measure of a predictable outcome. Designed to achieve higher accuracy and minimize risks involved with standard ‘freehand’ implant placement, Simplant guides are based on more than 100,000 patient-specific planning cases giving you confidence and peace of mind. The fact that mySimplant Planning Service operates in the secure environment of mySimplant.com guarantees that your patients can rest assured that their data is protected. 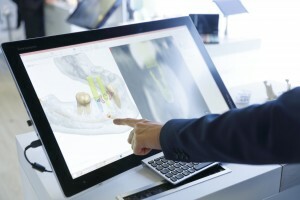 Leverage your pay-as-you-go access to the benefits of computer guided implant treatment and Simplant expertise with no software investment and no long-term commitment. It’s really the best of both worlds. Rely on the backing of Dentsply Sirona Implants, a solution provider with more than 40 years of experience in all fields and technologies of implant dentistry, and Simplant, an innovator in surgical guides and digital planning – all on a case-by-case basis. Getting started with computer guided implant treatment is easy and affordable. Go to mySimplant.com, check out our step-by-step system and watch your dental business grow case-by-case.